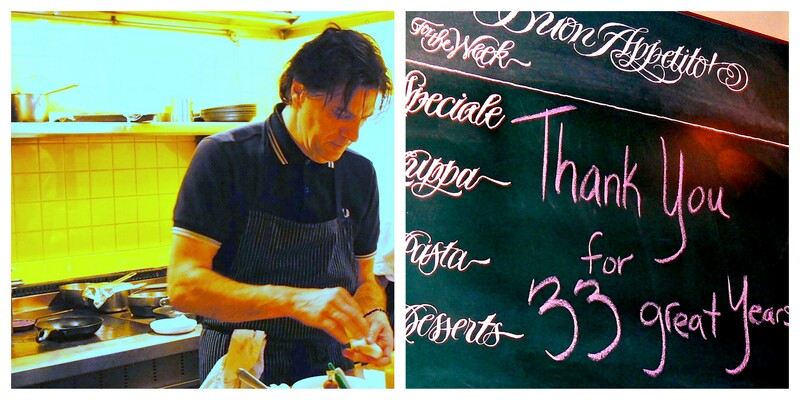 Scott Carsberg in the kitchen at Bisato, menu board on the final weekend at Trattoria Mitchelli. Two names from Seattle's glamorous restaurant past have resurfaced. First, Scott Carsberg, the gifted chef who ran two of Belltown's best restaurants (Lampreia and Bisato) for two decades before dropping out of sight, is back in town. He's got a new backer, restaurant investor Susumu "Sam" Takahashi (notably in Shiro's and Kashiba), and, it seems very likely, a "new" spot in Pioneer Square. The new location, 84 Yesler Way, is the site of the lmuch-missed Trattoria Mitchelli, which has been vacant since New Year's Eve of 2009. Longtime owner Dany Mitchell retired to become a property manager in Provence and was last heard from five years ago. Although he returned to Seattle this week to meet up with Carsberg and perhaps put in a good word with the landlord. A native of West Seattle, Carsberg made the rounds of European and American capitals and grew particularly fond of Italian cuisine. Back in the US, he worked at Settebello before setting off on his own. Talented, meticulous, a chef whose charismatic personality was not universally admired (hey! we all know people like that! ), he was nominated three times for a James Beard award before finally winning, in 2006, some 15 years after he and his wife, Hyun Joo Paek, had opened Lampreia in Belltown. Carsberg had never cooked a James Beard dinner; he did not attend the awards ceremony. Then, in 2010, he pivoted from high-end, prix-fixe Italian dinners to casual, Venetian-style small plates; for the next two years he devoted every bit as much energy and concentration on a $10 dish as on a full-blown, five-course meal. Commendable, surely, but not sustainable. By October, 2012, after a 20-year run at full speed, Carsberg called it quits. The location of the restaurant and the identity of Carseberg's backer was first reported by the Daily Journal of Commerce. This page contains a single entry by Cornichon published on May 13, 2018 6:00 PM. Velociraptors bring down Paris shared bike program was the previous entry in this blog. To market, to market, to market. But which one? is the next entry in this blog. To market, to market, to market. But which one? Je m'appelle France. Et toi?